The European Union has set a goal to obtain 20 percent of its energy from renewable sources by 2020. Because Europe does not produce enough timber to meet this type of demand, imports of wood pellets from the U.S are increasing. Fortunately, the entire wood pellet industry is undergoing huge structural changes that will ultimately help provide better stability and greater availability in the longer term as the production capacity in North America increases. However, in the short term, prices are being driven up by these new large customers overseas as the pellet mills have not been able to scale up production fast enough to keep prices from rising. 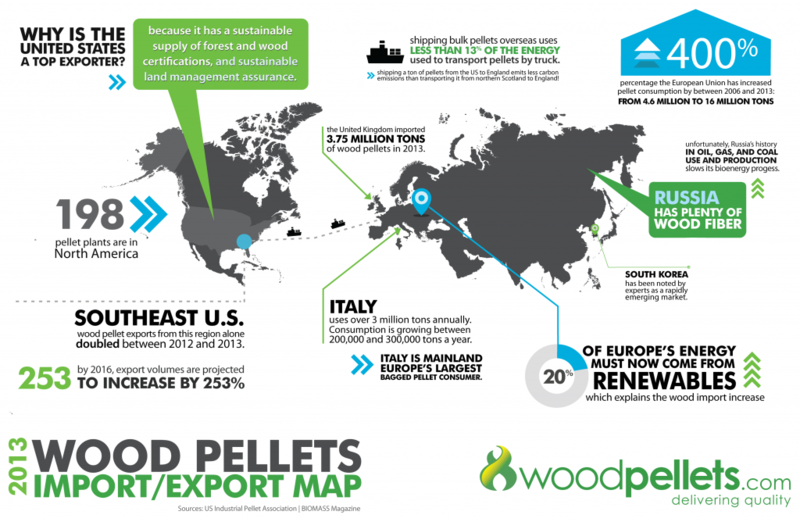 According to the European Pellet Council, global trade in wood pellets is expected to increase five- or six-fold to 60 million metric tons by 2020. As the diagram below demonstrates, wood pellets have quickly grown from a residential home heating alternative into an international energy and environmental super-power. As the industry has grown, the demand for raw materials to make pellets has gone way up. Normally, this would drive up the costs for those materials considerably, but luckily we have the Internet to thank for keeping the cost increases due to raw materials mostly in check. As the economy moves to electronic communications and away from paper, there is less demand for wood products from paper mills, which has (mostly) balanced out the increased demand from the pellet mills. Another factor that drives prices of wood pellets is the cost of fossil fuels – for two reasons. First, most pellet mills are still powered by electricity and traditional fuels to make the pellets themselves. Second, the cost to transport pellets via trains and trucks from the mills to people’s homes is mostly dependent on diesel fuel. This still results in a lower overall environmental impact than using fossil fuels for heating, but it still affects the price of wood pellet production. The need for residential wood pellet heating supply has increased overall, as well as in the short-term, as we saw most dramatically during pellet shortage in late February and early March of 2014. Although there were retailers who increased prices during the pellet shortage, we are proud to say that WoodPellets.com never raised prices. We also never turned new customers away – or stopped delivering pellets. The best pellets take the best raw materials and the most exacting manufacturing process. Even in cases when the other factors may not be changing on average, one or more of these factors may change specific to a particular product. For example, the highest heat output and lowest ash pellets are made exclusively from Douglas Fir. – if the price of Douglas Fir changes, the price of pellets made of Douglas Fir will also change. Even with these 5 Factors, the vast increase in demand is a testament to how pellet prices are remarkably stable and efficient vs. other heating fuels. By burning 4 tons of pellets over the course of a winter, a typical family stands to save close to $700. You can calculate your own savings with the Woodpellets.com Savings Calculator. WoodPellets.com makes every effort to provide our customers with the best value in wood pellets – and to keep pricing as stable as possible. By adding capacity, focusing on reducing distribution costs, and using the latest technology to improve our efficiency, we have been able to hold pellet pricing steady over the last couple years and minimize pricing changes even in the face of the huge changes in the industry. Given the substantial economic and environmental benefits over traditional fossil fuels, we expect the demand for wood pellets to continue to grow for the foreseeable future. From residential pellet stoves to replacing coal in electricity generation – wood pellets have become a very hot commodity. Pun intended! To conclude, we strongly recommend you buy your pellets early this season. Not only will you be able to take advantage of low Spring pricing, you’ll also avoid the risk of further pellet shortages. Visit us online at www.woodpellets.com or Call 1-800-735-5387 for pricing and delivery options in your area! Previous article Spring Stock Up Sale: Don’t miss out! Next article Upcycled Pellet Bag Challenge: Win a FREE Pellet Stove Cleaning!